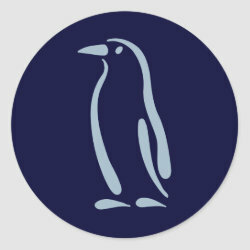 This is a simple yet bold stylized line drawing of a penguin. Just a few thick brushstrokes put together make this a clear impression of a plump, thick-billed penguin. This is an original drawing that makes a great gift idea for anyone that loves penguins!